To Date, Kepler has found 5,017 Exoplanets and 1,741 have been confirmed from our ground based Telescopes and our space orbiting telescopes like Spitzer. Through a statistical study based on what Kepler has found so far there are as many as 100 Billion planets in our Galaxy. This is truly amazing. NASA and JPL are on the verge of finding that Holey Grail, an "M" Class planet the could support life. This will be the ultimate discovery and I believe it will happen sooner than later. It will be the greatest discovery of all time. However don't expect a trip to that yet undiscovered planet because as it will not be around the corner but many 100's of light years away. My paintings are a way for me to imagine what these other solar systems may be like. Some may be new, some may be old and some may have life. 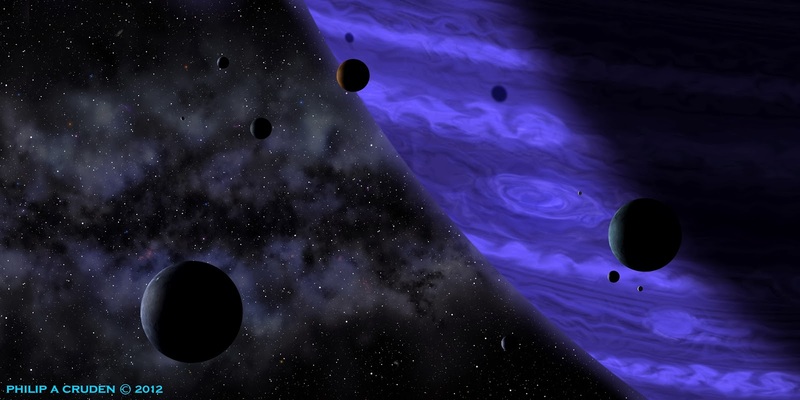 For the best information on the Kepler Mission visit Planet Quest on JPL's website. Just click on the link below. "So what is an Exoplanet"
So what is an Exoplanet? 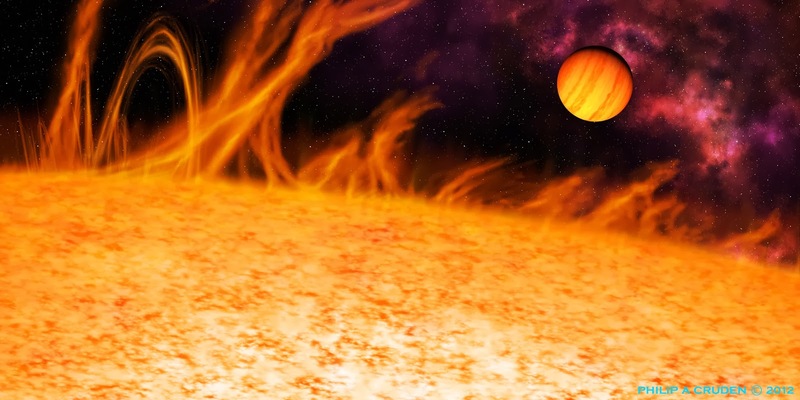 An Exoplanet also known as an Extrasolar Planet is a planet that orbits a star other than our Sun. In 1988 the first planet orbiting a star was discovered. As of September 2016 there have been 3,518 Exoplanets found in 2,635 Planetary Systems and 595 multiple systems. All thanks to some amazing astronomers and the Kepler Spacecraft. The Kepler Spacecraft was launched by NASA in 2009. In short Kepler’s mission is to survey a very small region of the Milky Way to discover Earth sized planets orbiting other stars. On average there is at least one planet per star. Some of the systems found have multiple planets and about 1 in 5 is stars like our sun with some having an Earth sized planet in the habitable zone. Astronomers believe there are around 200 billion stars in our Milky Way Galaxy. Based on the number of planets discovered in the tiny region that astronomers are looking at one can hypothesize that there are potential 11 billion habitable Earth sized planets in the Milky Way. If we include Red Dwarf Stars like the recently discovered system on Alpha Centauri (a Cen) which is only 4.37 light years away; that number goes up to 40 billion. Space is really, really, really big and the distances are great. To put this into perspective mark a tiny grain of sand at the beach, that represents out sun. Now pick up another tiny grain of sand and walk 4.37 miles. That is the relevant distance to our next neighboring star Alpha Centauri. 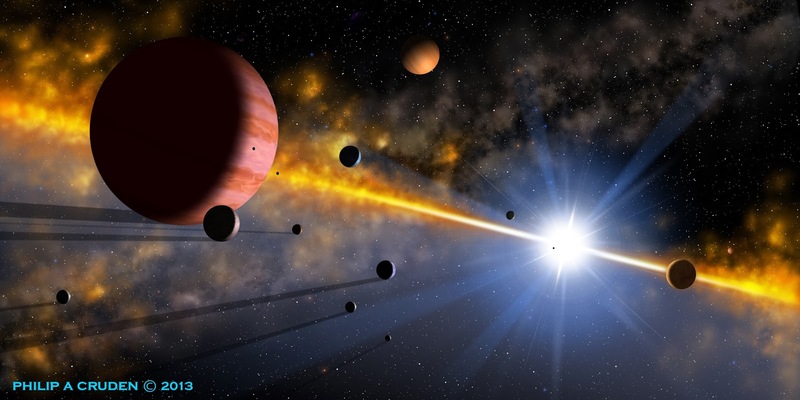 Planet hunting is not easy task but planet hunters have made amazing strides enabling them to figure out the makeup of planets like water, nitrogen, carbon, methane and so on using different types of light spectrums’. 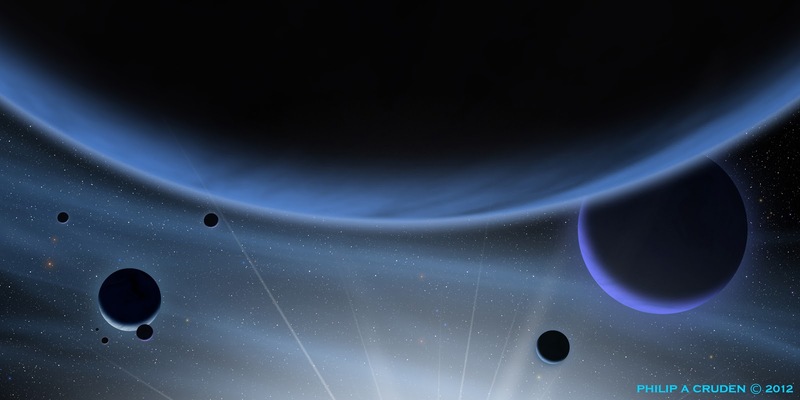 In many ways we are just scratching the surface when it comes to planet hunting. As I mentioned earlier space is big and so are the distances but the search for life continues. We have no smoking gun for life on other worlds just yet but new technology is well under way and some day we may find that smoking gun. 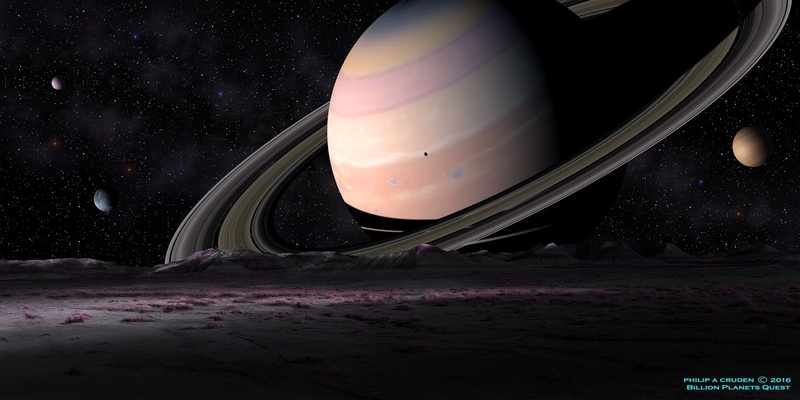 In creating this image I wanted to depict a Saturn like planet with a host moon in the foreground that has some plant life. Where there is plant life, there be water, microbes and all the other ingredients for life. In 2011 Kepler discovered a Binary Star System. 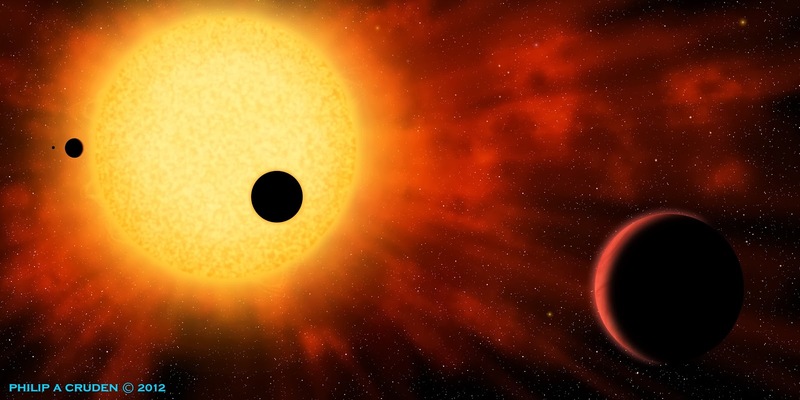 Prior to this discovery, the thought of a binary star system was a thing of science fiction. It is science fact. 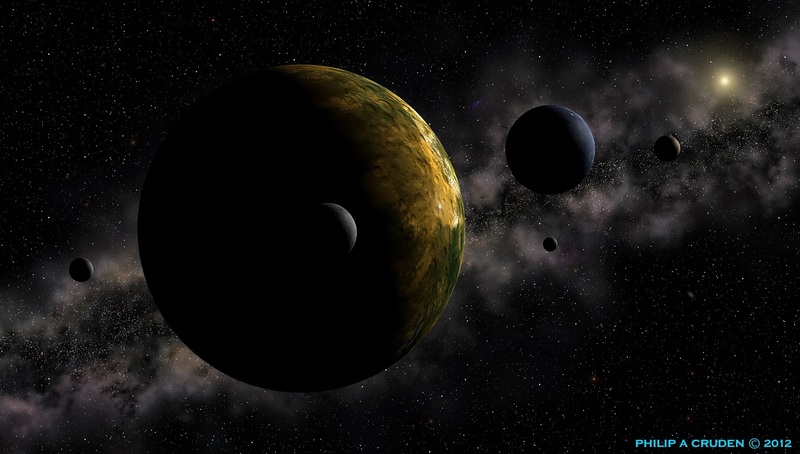 The system Kepler found has 2 stars (suns) and one planet orbiting the two stars. In this painting I have depicted a complete solar system with 2 suns and an earth like planet with the Milky Way as the backdrop. Who knows, this could be one of Kepler's next discoveries. When a star's life is coming to an end there are a number of ways in which it can die, and more than one stage to that death. Our own sun, is destined in its first stage of death to become a Red Giant before its final destruction. 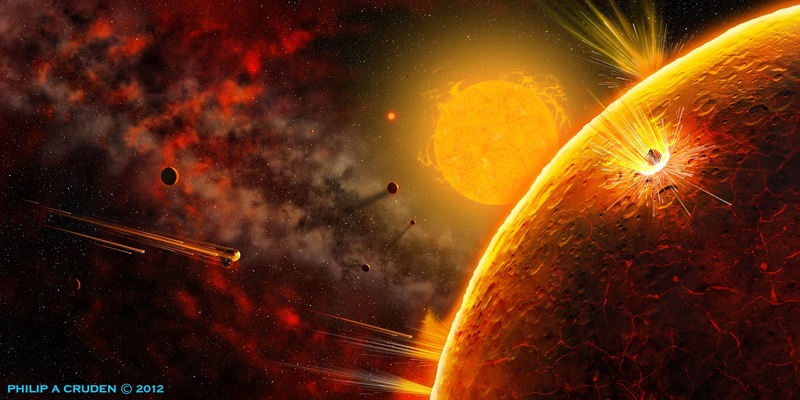 Some stars cast their outer layers into space leaving a hot dense core to cool over eons. But some other types of stars die in one of the universe's most massive spectacle there is, a Supernova. A Supernova can shine as brightly as an entire galaxy of billions of "normal" stars. In some cases the star is completely destroyed by the explosion while others leave behind either a super dense Neutron Star or a Black Hole. No matter how a star dies its death is one of incredible explosive energy and absolute mass destruction for any neighboring planets, moons, comets asteroids and of course any life. Kepler has discovered many new solar systems and planets and most of the planets it has found are Gas Giants similar in makeup to Jupiter or Saturn. Some are much bigger and some are much closer to their host star. Gas Giants, in relative terms, form quicker than solid planets. In this painting there is still nebulous dust (Molecular Clouds) because I wanted to depict the solar system as relatively new. Our own solar system would have had the same dust many millions of years ago while it was still forming into it's present state. With all the planets Kepler is finding it would be hard to imagine that none of them have moons. 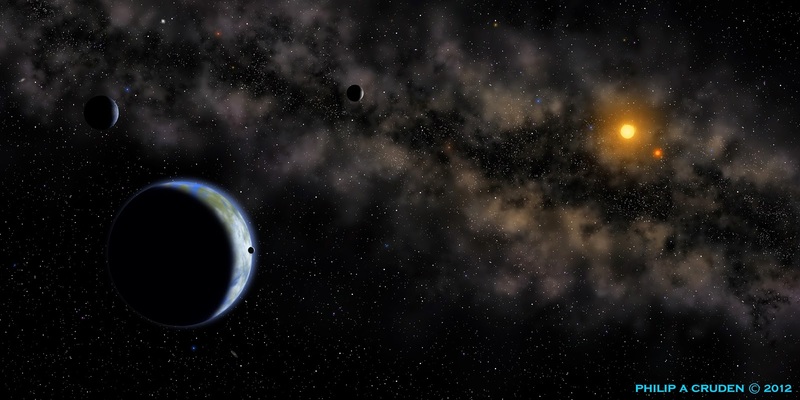 Detecting a planet orbiting a star is difficult enough and then of course the ground based telescopes have to study Kepler's finding to confirm there is a planet and of what type and size. So far trying to see moons too is not part of the mission. It takes very little imagination to believe there must be moons when you consider that Jupiter has 64 of them. This is my impression of one of Kepler's planets with moons. "Pluto, Charon, Nix and Hydra"
Pluto was discovered in 1930 and was classified as a planet until 2006 when it became known as a Dwarf Planet. It is now known as the 10th largest body in our solar system (after "Eris", discovered in 2005). Pluto is located in the Kuiper Belt along with many other Dwarf Planets, hence the new classification. Pluto has five moons, the latest two new ones where just discovered in 2011 and 2012. Pluto was discovered at the Lowell Observatory in Flagstaff AZ. Lowell at the time was looking for Planet "X" until his death in 1916. Unknown to Lowell, his observatory had captured two faint images of Planet "X" (Pluto) in 1915. After some legal battles the search for Pluto did not start up again until 1929 and was confirmed on Feb, 18, 1930 by a 23 year old man named Clyde Tombaugh. Now you may be asking, "What is Pluto doing on my Kepler page"? 60 years passed before we would discover another planet that was not in our solar system and was seen from a ground based telescope. Almost 80 years later Kepler was launched in 2009 and to date has found 3,025 planets and has confirmed 709. We have come a long way since 1915 and 1930. Side Note: New Horizons left for Pluto in 2006 and will reach Pluto 2015. In 2007 it was thought that Pluto only had three moons. Now that there has been the discovery of two new moons that were not accounted for with new horizons trajectory. Mission planners are taking a very close look at all the math. Good luck everyone. 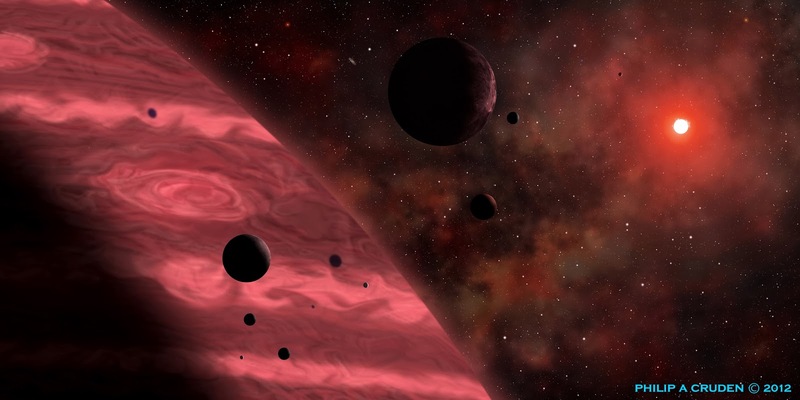 Among some of the planets Kepler is finding, some are new, some are old. This painting is about a new Solar System forming. A star forms out of nebulous gas (Molecular Cloud) (lets call it MC for short) much like what you see in the Great Orion Nebula. The MC contains the building blocks of life holding all the elements. Over time, gravity and pressure pulls the MC together on itself, forming a large Plasma sphere. As the sphere gets bigger and bigger more and more of the MC is attracted to the sphere by gravity. Keep in mind the MC is made up from the elements. Over time the Plasma sphere gets denser and denser. Think of compressing the earth down to the size of a beach ball and the beach ball keeps getting bigger and bigger. Everything at the molecular level is now getting compacted so tightly and the friction is so intense, a fusion reaction takes place. Atoms of hydrogen are fused together to create helium and a star is born. In the outburst of the star's initial fusion reaction the remaining MC is pushed away from the star like the wave signature of an explosion. Over time gravity once again acts on the MC and planets start to form. Some become Gas Giants like Jupiter and some become big spheres of rock. In some cases the MC comes together in the right place to form a planet like earth. Over time the planet cools, comets that formed from the MC deliver water and the star delivers its vital sunshine for life to start forming. This process of course does not happen in a few days. It takes billions of years. It is believed that over time some stars use up all their energy and go super nova and the whole process starts over again. This of course is the simple explanation. I hope my painting helps with the explanation. For me, there is something very tranquil when sitting on a beautiful lake in Algonquin Park in Ontario Canada. However I must surmise that if it were possible and there was a way to get away for a day and head off to one of the gas giants Kepler has found out there and just sit and stare. That would be the ultimate in tranquility. But let's be honest. If that were possible there would have to be a stop at the Orion Nebula after wards.